Ann Arbor is a ceety in the U.S. state o Michigan an the coonty seat o Washtenaw Coonty. ↑ "US Gazetteer files 2010". United States Census Bureau. Archived frae the oreeginal on 14 July 2012. Retrieved 25 November 2012. ↑ "American FactFinder". United States Census Bureau. Archived frae the oreeginal on 17 February 2012. Retrieved 25 November 2012. ↑ 4.0 4.1 "Ann Arbor". Geographic Names Information System. Unitit States Geological Survey. 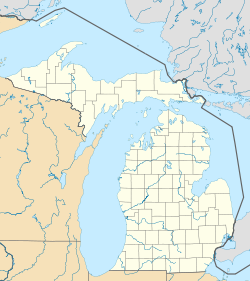 ↑ "Bibliography on Washtenaw County". Clarke Historical Library, Central Michigan University. Retrieved 23 January 2013. This page wis last eeditit on 22 Apryle 2017, at 02:29.